The other day I realized I didn’t know what civilization was, which ordinarily would not give much pause, for I am resigned to incomprehension regarding humanity, but the thing was I had to teach “civilization” as a vocabulary word. So I looked it up. 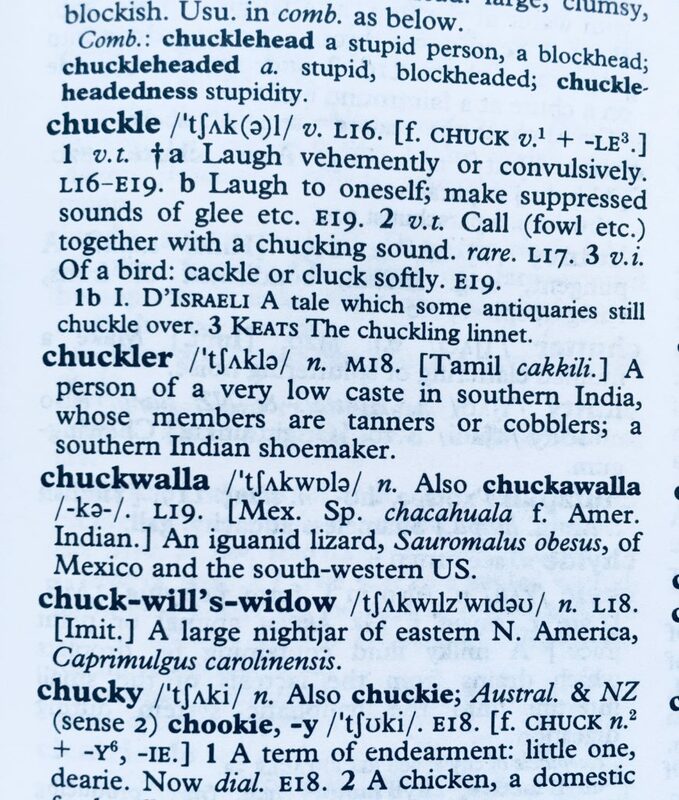 As ever with the Shorter Oxford, I get easily distracted, and this time among my diversions was the word chuckler. Naturally, my first thought was that The Chucklers would make an excellent band name, but Merciless Google says: too late. The “very low caste” got me thinking, though. Just last week I was describing to a friend the following indignity: I take my dog for a walk, and he moves his bowels, and I stoop to collect the result. But that’s not it: sometimes afterwards he kicks his hind legs to cover said result with some kind of dirt-flush, so I have to wait a bit before stooping. However, sometimes his hind legs do an unexpected reprise. More than once I have gathered dog feces while having dirt kicked in my face.